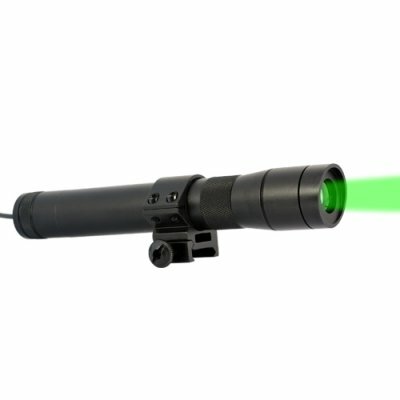 Successfully Added Long Distance Green Laser Designator for Rifles, Guns to your Shopping Cart. Fully illuminate targets and areas up to 300 meters away at night with this powerful Long Distance Green Laser Designator. With the strong yet light aluminum build and black matte anodized finish, this Long Distance Green Laser Designator is meant to be taken and used anywhere. It fits onto rifles/shotguns with a weaver rail mount and comes with a 2-in-1 tail line switch which lets you easily toggle between its two lighting modes: always on/off or pressure activated, which lets you go from hidden to hunting mode in one quick press of a button. This Long Distance Green Laser Designator's beam diameter can also be easily adjusted to turn into a light source for night hiking. Just rotate the collimator ring and watch as the laser turns from a focused beam into a large and spread flashlight-like light, fully illuminating the area ahead of you. If you get into an accident or want to alert others of your position, just rotate it back to a thin and powerful beam, providing a pin point rescue location. Available in our warehouse now, order today and we'll express ship it out to you tomorrow. With our 12 month warranty and excellent customer service, both you and your dropship customers are sure to be satisfied. Brought to you by Chinavasion, the leader in wholesale electronics. Handheld lasers can be hazardous when mis-used. They should only be used responsibly by adults and never pointed at people, animals, or transport. Many countries have import restrictions on laser products - please check your destination rules before committing to orders. LASER ADVISORY Please additionally note that lasers over 5mW cannot be advertised for sale on eBay and may be restricted in our checkout for Paypal payment option.